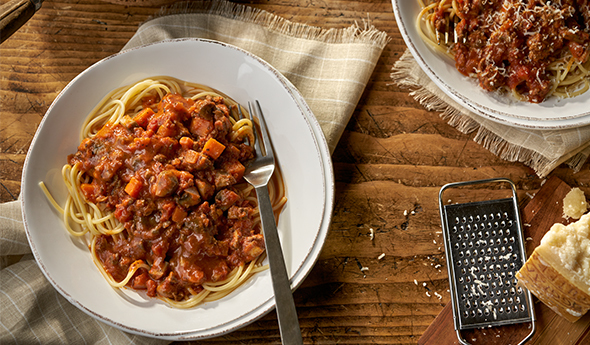 Cutting back on the beef and bulking up with mushrooms makes this version of a classic Bolognese hearty without being heavy. Our sauce delivers the fresh ingredients that you’ll need for great flavor. Make it yours with some red wine and a touch of cream. Season the beef as desired. Heat the oil in a 12-inch nonstick skillet over medium-high heat. Add the beef, mushrooms, carrots and garlic and cook until the beef is well browned, stirring often to separate meat. Increase the heat to high. Add the wine and heat to a boil. Boil for 2 minutes, stirring occasionally. Reduce the heat to medium. Add the sauce and cook for 5 minutes, stirring occasionally. Stir in the half and half. Season to taste. Add the spaghetti and toss to coat. Serve with grated Parmesan cheese, if desired. I find this recipe to be watery. Not a thick sauce. The beef broth does not add anything to the flavor. Actually I don't think it is needed. Since the mushroom and carrot naturally give off some water as they are cooked. It would be a good idea to cook it a little longer to make the sauce thicker. Definitely needs some added spices.